Slow cooker beef Bourguignon recipe. I found this beef recipe on http://www.thecomfortofcooking.com/2017/11/slow-cooker-beef-bourguignon.html and I love it! Beef chuck roast with vegetables, bacon, and mushrooms. Very nice combination! It is a little different off this one but really simple and extremely delicious! You can also prepare beef Bourguignon in a pressure cooker or an oven if desired. Instructions: Finely chop the bacon. Preheat a medium nonstick skillet to medium-high heat. Add chopped bacon and cook and crisp. Once it is crisp, remove it, using a slotted spoon and transfer to 6-quart (6 L) slow cooker. Next, cut the boneless beef chuck into cubes. Place cubed meat in the hot and skillet and brown on all sides, stirring occasionally. Remove the browned beef from the skillet and transfer to the slow cooker. Wash and slice white mushrooms. Wash and peel baby potatoes. Peel carrots and chunk. Peel the half of yellow onion, then slice it. Peel and mince garlic cloves. Place all vegetables and fresh herbs in the cooker and stir well. Pour the wine into the hot skillet, scraping up any browning bits from the bottom of the pan. Reduce heat to low and simmer until the wine has reduced by half, then pour in chicken broth, tomato, and soy sauces. Mix well and continue simmering. 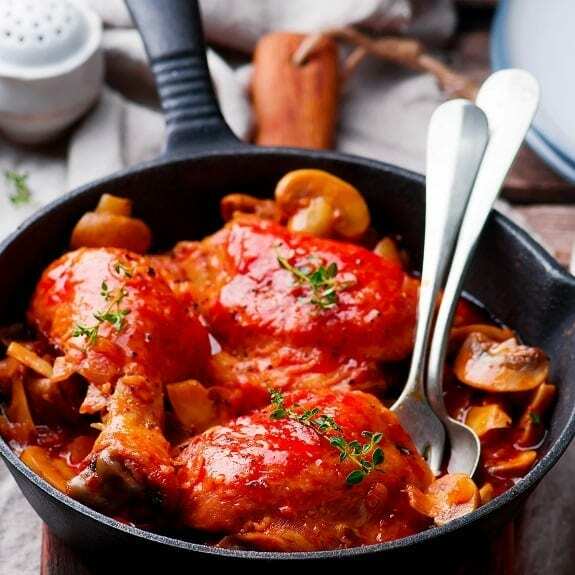 Remove the wine mixture from the skillet and pour into the slow cooker. Cover the pot and cook on low-heat setting for 6-8 hours, or on high for 3-4 hours. Turn off the slow cooker and open the lid. Mix beef Bourguignon well before serving. Ladle into soup bowls. Serve hot. In a medium nonstick skillet, cook bacon over medium-high heat. Using a slotted spoon, remove cooked bacon from the skillet and transfer to a slow cooker. Add cubed beef to the hot skillet. Cook, stirring, until borwned. Remove browned meat from the skillet and transfer to the slow cooker. Top with potatoes, mushrooms, carrots, onion, garlic cloves and thyme. Stir well to combine all ingredients together. Pour hte red wine into the skillet and simmer, scraping up any browned bits from the bottom of skillet, until the wine has reduced by half. Pour in the chicken broth, the stir in the tomato sauce and soy sauce. Stir the wine mixture well and bring to a simmer. Pour into the vegetables and beef in the pot. Close the cooker and cook on low-heat setting for 6-8 hours or until vegetables and beef are tender. Top with chopped fresh herbs and serve immediately. Enjoy!